These garages are large enough for the largest family car and one of the 'cleanest' garage choices on the market. 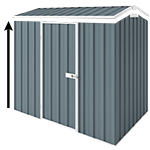 Absco Eco Garages are top Aussie made buildings and you can add one of these eco friendly affordable garages to your home. It will provide maximum storage for two vehicles as well as some added storage space. This ECO Double Garage offers a large storage space which will be adding value to your property as well as prolonging the life of your valuable items which are being stored safely.